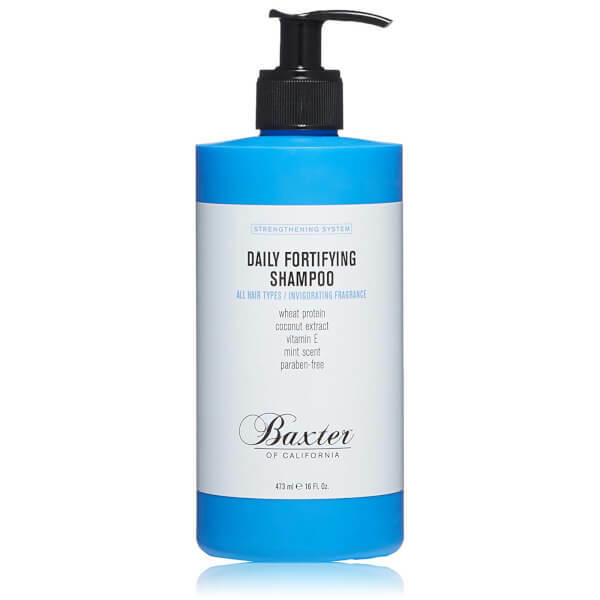 Leave hair feeling fresh and clean with the Baxter of California Daily Fortifying Shampoo; a lightweight, nutrient-rich formula developed specifically for men. Powered by Coconut Extract, Wheat Protein and antioxidant Vitamin E, the revitalising shampoo effectively eliminates dirt and product build-up, whilst moisturising the scalp and promoting healthy hair growth. A dose of Mint delivers a pleasant tingling sensation for an invigorating and aromatic cleansing experience. 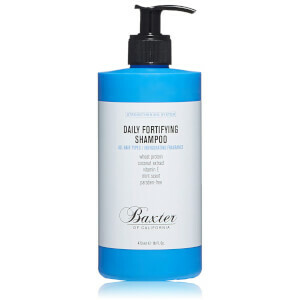 Apply throughout hair, massaging into the scalp. Rinse thoroughly. Repeat if necessary. Aqua / Water, Sodium Laureth Sulfate, Citric Acid Cocamidopropyl Betaine, Glycerin, Sodium Hydroxide, Sodium Chloride, Hexylene Glycol, Parfum / Fragrance, Sodium Benzoate, Salicylic Acid, Polyquaternium-10, Hydroxypropyltrimonium Hydrolyzed Wheat Protein, Limonene, Tocopherol, Sodium Acetate, Cocos Nucifera Fruit Extract / Coconut Fruit Extract, Phenoxyethanol, Isopropyl Alcohol, Xanthan Gum, Ci 42090 / Blue 1, Ci 19140 / Yellow 5, Potassium Sorbate.